Websites designed to take advantage of the unique features in Internet Explorer 9 provide an immersive user experience that can increase customer loyalty and drive traffic. To obtain these benefits, though, you'll need to optimize your site to capitalize on IE 9. The latest flagship browser from Microsoft is more than just an incremental update. It offers unprecedented integration between Windows and the Web, essentially extending the desktop experience to include the Web itself. As our use of the Web has evolved, more people are embracing cloud-based applications such as Gmail, Box.net, and Mint.com. The experience of using sites like these is more like using a traditional desktop application, though the application lives out on the Web. IE 9 can provide a similar type of interactive experience for any Website. To start, any user can get this integration simply by dragging a Website icon to the Windows 7 task bar, just as you might with any software application. Pinning a site to the task bar makes it more visible and directly accessible for the user. But to give users a reason to want to pin your site to the task bar--and more importantly, to give them the means to interact with your site as if it were an application installed on their local PC--you need to take advantage of Jump Lists, a Windows 7 feature that displays menu options for jumping directly to specific functions, or for accessing frequently or recently used features. IE 9 also ties in with unique features of Windows 7 that enable users to treat your Website as if it were a local application. You can create custom Jump List menus that appear when users click your Website's icon on the Windows task bar. Jump Lists let users access frequently or recently used content, and receive dynamic alerts when new content appears. Making suitable tweaks to customize your Website for IE 9 does require at least some understanding of HTML and Web coding. With a little knowledge, though, you can do the job in just a few minutes. One trick is to drag the icon for any Website from IE 9's address bar to your Windows 7 task bar, pinning it there permanently. You'll see the site's logo on the task bar, and you can click it to access that Website instantly. LinkedIn and Windows Live are among the sites that have taken advantage of Jump Lists to enable themselves to function more like applications. With LinkedIn or Windows Live, users can click items in the Jump List to go directly to specific pages or functions within the site. 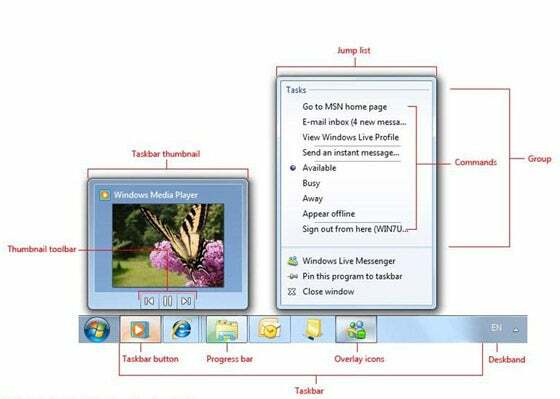 This Microsoft diagram shows interactive functions of the Windows 7 task bar. Pinning Facebook to the Windows 7 task bar provides little more than a simple shortcut to the site, but LinkedIn and Windows Live deliver a more integrated experience resembling a locally installed software application like Outlook. Adding Jump List tasks to your site is relatively simple, so why not give your visitors a reason to pin your site to their task bar? With IE 9 and Windows 7, the Jump List tasks link to static URLs that a user can click and access directly even when the pinned site itself is not open. You can include Jump List tasks for your site's most common features so that users can jump straight to those functions without having to open their browser and navigate to the appropriate page manually. From the Windows 7 task bar, the Jump List for Facebook (left) is bare-bones, whereas those for LinkedIn (middle) and Windows Live (right) take greater advantage of it. Hilerio explains that this code defines two tags: 'Task 1' and 'Task 2'. Selecting 'Task 1' will cause the software routine to display the Page1.html site, and selecting 'Task 2' will cause it to display Page2.html, which is an external site on the Microsoft.com domain. Each task will open within its own tab of the pinned-site browser instance. If the pinned site is not currently open, clicking one of these Jump List menu items will open a new browser instance.